This is in response to: Seeing The Lizards: Food (where I can’t comment directly as the only account I have that would work is Google and I don’t like using it). 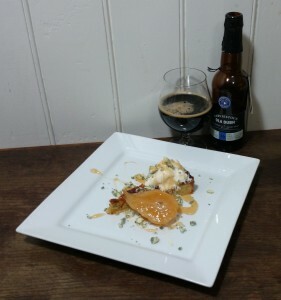 It is important for us beer-foodies to recognise that beer and food pairing isn’t for everyone – and I believe all those I know are not so blinkered as to think otherwise. Whilst I’d love it if everyone would try something once to give it a go… some folk are happy to stay within their comfort zone and it isn’t right to pester them about it or label them “wrong”. Labelling them “philistines” is something I hope would only happen in jest – albeit sometimes people do take it all far too seriously. Regular reality checks are good to keep us passionate folk grounded. I also think it is important to be open about the fine details of pairings being, for the most part, subjective. The fine details of flavour are subjective and context sensitive as it is. However, the oft referred-to cut/complement/contrast rules do work – like many blunt instruments. Hammers for nails, screwdrivers for screws. The work of the pairer (sommelier perhaps) is to try and ensure a good, and ideally fun, experience. Some things will not work. In a person-to-person context is is also important to account for the diner – working within their tastes where needed, helping to explore their boundaries where desired. For my own part I was a “foodie” (a term I particularly dislike) for a looooong time before becoming a beer geek. I’ve probably been a “beer geek” for less than five years. In contrast, well over a decade ago in 80s/90s Australia I grew up in a restaurant surrounded by gourmet variety, my father a trained chef of the traditional school and my mother with a modern creative flair for food – all bases covered. In this sense I don’t regard my views on beer+food as coming out of some odd beer-vs-wine-inferiority-complex… they come out of being a food lover who discovered the flexibility and power of beer in the food context who wishes to spread the joy of the discovery. But at the end of the day it is about turning the necessary sustenance of life into entertainment. Like TV programme genres the entertainment value won’t be the same for all. I accept that, just as I accept “craft beer” isn’t for everyone, and “gourmet dining” isn’t for everyone – the combination of the two certainly isn’t. 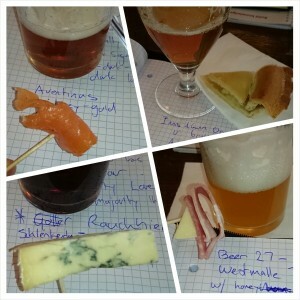 This entry was posted in Food Matching and tagged Food Matching, philosophy by Yvan Seth. Bookmark the permalink.